Find hotel near Samut Prakan Crocodile Fa .. The Samut Prakan Crocodile Farm and Zoo, where the world’s largest Crocodile in captivity is held, is an invigorating, and sometimes terrifying experience. Observe the majestic creatures up close (well, as close as you can safely get) and watch their raw, natural behavior. Apart from crocodiles, visitors can also see elephants, horses, hippos, and other animals. Children especially enjoy the elephant ride, the toy train rides, paddle boating and many activities organized in the zoo. Don’t miss the daily crocodile shows, where highly trained handlers show deadly stunts with crocodiles, including putting their hands, heads and arms inside the crocodile’s wide open mouth. Scary! 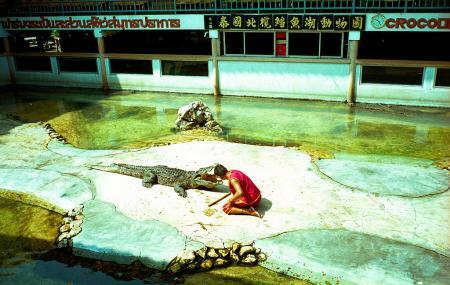 How popular is Samut Prakan Crocodile Farm And Zoo? People normally club together Sukhumvit Soi 19 and Sri Nagarindra while planning their visit to Samut Prakan Crocodile Farm And Zoo. When I first heard about this place I believed it was a crocodile farm. However, it turns out it was a zoo where animals were made to do tricks for entertainment. The elephants in the picture are chained to the ground with small chains. Sadly I am unable to upload videos of the elephant show for this review. The elephants were trained to reach out there trunk to recieve money from the audience and give it to their trainers who pocketed the money. I highly doubt that money went to looking after the animals as the cages were very baron. Most enclosures were concrete with some water, others had a dried out log or some sand if the animals were lucky. I'll give them credit one enclosure I saw, for a tiger, actually had some grass and a tree. Overall a very sad experience, the animals looked sad and often had scars, some of the turtles shells were sunken. Ivory was also sold with many of the elephants not having tusks, photos of this was not allowed. Samutprakan Crocodile Farm and Zoo in Bangkok, Thailand is a crocodile zoo, considered one of the largest crocodile farms in the world. There are more than 100,000 crocodiles at the farm, beside a sizable number of other animals like elephants, lions, tigers, monkeys, pigmy horses and hippos. Daily crocodile and elephant shows are held in the farm which offer thrill and excitement to the visitors. The farm is about 20 km away from city center of Bangkok and is easily approachable through metro, bus and taxi. A visit to Bangkok cannot be considered complete without a visit to the Crocodile Farm. Crocodile show is very exciting. This is one of the most pleasant spots in Rhailand. If this is your passage way, I recommend to visit here just for an hour. There are more that a crocodile show, tigers, birds etc. are included. Compared to its reasonable ticket price, this is beyond my expectation. Terrible so rude service. We have been there few months ago and with our permanent residence in Thailand we paid 80bath for entrance. This time we were charged 350bath ( foreigner price ) even for kids aged 5 under. I asked them about it , all I got was extremely rude attitude! I asked for manager since I refused to be ripped off and then I got even more bad attitude. Wasted our time and energy on going there. Never have I encoutered such foreigners hating attitude in Thailand.